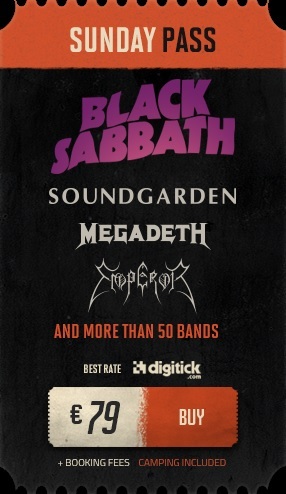 This entry was posted on February 17, 2014 at 5:41 pm and is filed under Gig Listing, Music with tags 1349, 3 day pass, Aerosmith, Annihilator, Behemoth, Black Sabbath, Carcass, Clisson, day pass, day passes, DEATH DTA, Deep Purple, Dublin, Emperor, France, Hellfest, Hellfest 2014, Iced Earth, Into the Void, Ireland, Iron Maiden, Megadeth, Opeth, Paradise Lost, Rob Zombie, Sabbath, Sepultura, Slayer, Soulfly, Soundgarden, ticket, tickets, VREID. You can follow any responses to this entry through the RSS 2.0 feed. You can leave a response, or trackback from your own site.